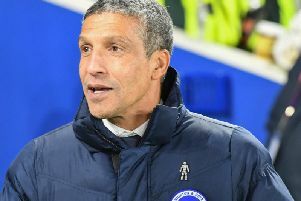 Substitute Tomer Hemed and German midfielder Gross netted in each half as Brighton were 2-1 winners over Ligue 1 Nantes in their final pre-season friendly at the Amex on Friday evening. Victory over the French outfit capped a pre-season where they lost just once - at League 1 AFC Wimbledon - and attention now turns to the league opener at Hornets next Saturday. German Gross felt everything was right about Brighton's performance against Nantes before they allowed them back in to for the final 20 minutes or so. He said: "Every team is very good in the Premier League and we can't play like we did in the last 25 minutes (against Nantes). We should be ready for 90 minutes every game. You can show after your quality on the ball but first you have to do the basics of running, fighting, winning one against one and work as a team, after that you can show your quality on the ball. "I think we won a lot of balls but then we sometimes have to be better with our final ball, of course it is always tight and the other team is also good, but we were really good in the first half and for some of the second half. We should perform this way over 90 minutes and we should be all right. We have a week, we won that is also important, we must keep going now." German Gross, who scored seven goals and bagged eight assists in his first Premier League season last time out, was pleased to be back on the scoresheet at the Amex after notching against Nantes. He added: " I'm always happy when I can help the team with a goal. For me, it's always more important to also help the team defend the lead. Keeping my composure on the ball, making sure I'm available but after I score or assist a goal I'm very happy. It gives me self confidence, that's what I want and that's what we want when we have a test."